Cotton and hosiery knitting mill construction in Alamance County began with High Falls Mill in 1832. Production began with Edwin Michael Holt and William Carrigan in 1837, with the start­up of the Alamance Cotton Factory on the Big Alamance Creek. During the ensuing years, mills sprang up all over the county. By 1949, Burlington could claim the title “The Hosiery Center of the South” because of the concentration of companies and plants located in the city and surrounding county. Fibers in use included cotton, rayon, silk and nylon; all were knit into hose and half hose for men and women. The first attempts to develop a hosiery industry in Burlington came at a time when cotton mills were in full swing turning out yarn and converting the yarn to ginghams, denims and the famous Alamance Plaids. Two unsuccessful attempts were made with cylindrical hose, which required adding the separate shaped foot. The members of the Holt family traveled extensively and had since Edwin Michael Holt brought equipment to start the Alamance Cotton Factory. The first hosiery operation was started in 1892 when Lafayette Holt, associated with Lafayette Mills and a grandson of Edwin Michael Holt, was in Philadelphia and saw machines thatmanufactured men’s hosiery. He brought back the first modern machines and started the first factory. The factory lasted only a year and yielded to the financial panic sweeping the country in the early 1890s. That factory closed and never reopened. The 1909 City Directory listed Alamance, Brown’s, Daisy, Graham, Juvenile, May, Sellars and Standard. In 1917, Daisy Hosiery became a foundation for May Hosiery Mills, Inc., which purchased a building on South Main Street in downtown Burlington in 1917 and moved the operation there. They also started a finishing plant as an extension of its facilities. Later, May became May­McEwen and then May­McEwen­Kaiser Corporation. In 1948, this historical operation became a division of the Burlington Mills. 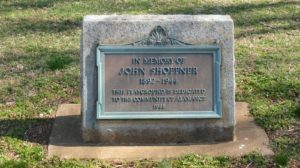 John Shoffner (1895 –1944) began Standard Hosiery Mills in the village of Alamance, and took over the old, rebuilt (1871) building of the original E. M. Holt Alamance Cotton Factory in 1926. Standard used this building for dyeing and finishing until 1947 when it closed. They demolished the building and saved original beams for use in the mill at Kimesville. The dyeing and finishing production moved to the original Aurora Cotton Mill building on East Webb Avenue founded by Banks Holt. John Black established Esther, the first hosiery mill in Graham, on South Main Street in 1927. Another mill, Scott­Baker and Company, purchased the Sidney Cotton Mill in North Graham and converted it to hosiery manufacture. In 1949, there were six hosiery mills in operation in Graham. The industrial guide of the Burlington Chamber of Commerce (1948) listed 50 manufacturers of hosiery and related industrial products, in Alamance County. 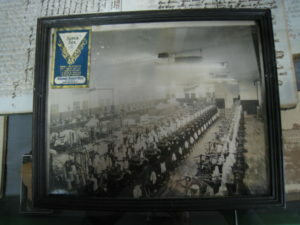 Many of these were small plants devoted to one aspect of thebusiness, such as dyeing or yarn manufacture; some are divisions of larger hosiery companies. Whitaker, W., 1949 “Centennial History of Alamance County 1849­1949,” Burlington Chamber of Commerce, Burlington, NC. “North Carolina Yearbook 1922,” News & Observer Publishing Co., Raleigh, NC 1923.